It’s no secret China has one of the fastest growing automotive markets in the world. Although somewhat slow in the first half of 2015, that hasn’t stopped Mazda from pulling ahead of the pack. Japan’s fifth-largest automaker has found its sporty designs are hitting home with the newest class of drivers. China’s car sales grew 1.4% in the first six months of 2015, the lowest in six years. Meanwhile, Mazda’s China sales saw the best first half ever with a 17% increase. 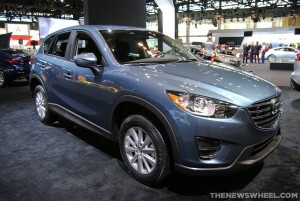 The sporty CX-5 SUV and Axela and Atenza sedans boosted sales dramatically. “Other cars are either too round or stocky, but the CX-5 has more of a flowing character,” said Xu Duo, 27, who bought Mazda’s sport utility vehicle last year. Yale Zhang, the head of Automotive Foresight, believes the “German myth,” which states that German brands are better than all others, is being broken. Rather than aiming to take control of more market share, Mazda is focusing on its branding instead. Too small to compete with the likes of General Motors and Ford, both of which are involved in a price war, Mazda isn’t offering discounts and cutting prices. Instead, the automaker is monitoring dealer inventories to ensure price stability. We here at Wantagh Mazda are proud to offer sporty vehicles at competitive prices!